As the President of the AIHA, Dr. Lacey has been leading a nation-wide policy initiative with federal partners at NIOSH on teenage worker health and safety. This week, through AIHA members, the State of Texas proposed HB2010, which aims to promote workplace hazard awareness training before young people graduate from high school. "Kids are told to not play with matches and to be careful around swimming pools at a young age," said Dr. Lacey. "Yet we never talk to kids about the risk of getting injured, sick or killed at work -- this proposed legislation will ensure this conversation happens. If we are successful in getting similar legislation across all 50 states, it could be transformational for the future of worker health and safety in the United States." Through this grant, Drs. Yiannoutsos and Wools-Kaloustian will enhance their understanding of the HIV care cascades and the outcomes of care in East Africa, provide insights on the optimal structure and impact of care and treatment programs, expand the set of tools available to inform implementation and operations research in resource-constrained settings and inform policy among stakeholders and decision makers at every level in the region as well as the broader HIV/AIDS scientific community. Over the next five years, they will receive $12,299,584 in funding. Join us in congratulating both Drs. Constantin T. Yiannoutsos and Kara Wools-Kaloustian on this honor. 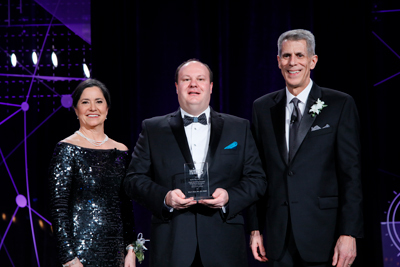 Dr. Brian Dixon was honored at the HIMSS Awards Gala, on February 21, 2017, at Loews Portofino Bay Hotel at Universal Orlando, with the HIMSS Book of Year Award for his title, "Health Information Exchange: Navigating and Managing a Network of Health Information Systems." A few concerns were raised about clinic patients waiting in the lobby as early as 6:30am, when few people were in the building. Beginning Monday, February 27, the building’s front entrance will revert back to being open and unlocked from 7:00am until 7:30pm. Please join us for a Night of Gratitude on Thursday, March 23, 5:30 pm, at The Willows on Westfield. Enjoy an evening of cocktails and hors d’oeuvres as we celebrate the hard work and dedication of the mentors who guide our students from the classroom to their careers. RSVP by March 16 online at myiupui.com/nog. Park in Parking Plaza 658 E St. Clair St.
Great universities are distinguished by the achievements of their alumni, faculty, staff, and students. The coveted Distinguished Alumni Service Award is Indiana University's highest alumni recognition award. Please make nominations for this unique, prestigious honor. You may use the DASA online portal. The link to the online nomination form can be found here, as well as a PDF of the nomination form. A list of previous recipients and the nomination criteria are also on this page. Please note that at least two letters outlining candidate achievements are required by the nominator and/or other interested individuals. Please submit nominations by March 31, 2017. The purpose of the Professional Development Grants program of the IUPUI Staff Council is to award recognition and financial support to individual staff members who engage in professional development activities which will enhance the status of and demonstrate the value of the entire staff at IUPUI. Apply here. Schedule our appointment at donorpoint.org. Submit a poster abstract for a chance to present your innovation in-person at NACHC’s annual Community Health Institute, the largest gathering of health center stakeholders and partners on record. This year’s conference will take place in San Diego at the Manchester Grand Hyatt from August 27 – 29 with the poster session taking place on Sunday, August 27. Deadline to submit poster abstracts for consideration is April 10. To submit a poster abstract or for more information on invited themes and what abstracts should include, click here. Poster submitters who submit poster abstracts under the “innovations category” are offered the opportunity to have their abstract included in the online Health Center Innovations Database so that they only have to submit their innovation once. SPEA Assistant Professor Brad Ray, the Marion County Public Health Department and the Indiana State Department of Health invite you to a presentation from state and local epidemiologists who will discuss the types of data they have access to and how academic researchers can request access to these data sets. We will also be highlighting recent collaborations between local epidemiologists and researchers. Marion County Health Department is asking for FSPH student volunteers for a Point of Dispensing (POD) exercise on March 30, from 12:00 - 3:30 pm. They are in need of volunteers to play the "client" role and walk through the POD for practice. Interested FSPH students can sign up here. All are invited to join the celebration of student (faculty-mentored) research that is helping IUPUI fulfill the promise of endless possibilities through discovery, exploration and innovation. This day-long event will spotlight the rich, cutting-edge and multifaceted research and creative activities that so many IUPUI students are conducting with faculty mentors. For more information and to register, please visit www.crl.iupui.edu. Questions can be directed to Etta Ward at emward@iupui.edu or (317) 278-8427. All are welcome to attend the first conference of the Latinx Community-University Coalition of Indiana, learn about (and join) this new coalition, and share the work that is already being done in our state. If you are university faculty, student or staff from any Indiana college or university interested in or already working with Latinos, please join. If you are a member of a community organization serving Latinos, please join. The aim of this organization is to connect us all to maximize the impact of everyone’s work. The ultimate purpose of the Coalition is to address equity and wellbeing across the state of Indiana through interdisciplinary collaborations for research and programmatic service aimed at improving the quality of life of the Latino population in Indiana. Students, educators, health professionals, and everyone in between, learn more about a phenomenon affecting a majority of people - trauma - on May 26. Explore the impact of trauma on health and academic achievement and where we go from her given what we know now. Eye opening revelations from keynote speakers and esteemed experts in the field, Dr. Vincent Felitti and Dr. Jeanie Tietjen. A variety of powerful breakout session. Explore strategies for combatting the impact of trauma. Learn skills to enhance education and health outcomes. And, a special self-care treat for caregivers (lay to professionals) about handling ompassion fatigue due to exposure to secondary trauma fo those for whom you care/educate. For decades, it has been common practice to address challenges around race and income as a means to improve education and health outcomes. Yet, new methods also include addressing trauma in order to influence outcomes. We invite you to join forces with us to help ensure academic achievement and improved health for the generations to come. Register here. Did you know that more than 13% of IUPUI’s journals articles were published in open access journals in 2016? Most of these articles required an article processing charge (APC) after peer review and acceptance and most were supported by research grants. Not every author, however, has access to grant funding. This means that sometimes an author finds a reputable OA journal that is a good fit for their article, but (without grant funds) they simply cannot afford the fee. If you have ever wanted to publish in PLOS, BioMed Central, SAGE Open, or in any OA journal indexed in the Directory of Open Access Journals (DOAJ), but you did not have a grant to help, you will be glad to know that University Library administers a campus-supported fund to assist authors. The IUPUI Open Access Publishing Fund underwrites reasonable publication charges for articles published in fee-based, open access journals. Open access journals provide free access to peer-reviewed scholarship and can be read by students, professionals, scholars, and the public at no cost. To recover the cost of publication, some (but not most) OA journals require payment from the author or the author’s institution after peer-review, but before final publication. By supporting publishing in trusted OA journals, the fund addressed changes in scholarly communications while increasing the impact of and access to scholarship created by IUPUI faculty. If you are an IUPUI faculty member and you need support for a submission to a journal indexed in the DOAJ, you can learn more about the fund and apply for support for your unpublished article on the library’s website. Launching this spring, CrimsonCard is the new official photo ID card for all Indiana University campuses. It will provide access to essential university services, including printing, meal plans, libraries, and recreational sports facilities, as well as secure entry to campus buildings and residence halls. Learn more about the Crimson Card here. Reserve a cap, gown and hood to wear at commencement and related events. Order apparel here. Rachel Hinrichs, Health Sciences Librarian at the IUPUI University Library, has updated services and resources available to FSPH faculty and staff. Do your students need help with research or evidence based practice? Ms. Hinrichs can teach classes or develop tutorials on advanced database searching, evidence based practice, source evaluation, and citation management. Do you teach on Canvas? Please add Ms. Hinrichs as the librarian for your course. She can answer your students’ questions about research, and embed subject and course-specific resources directly into the course site. Getting started on a systematic review or extensive literature review? Ms. Hinrichs offer tiered systematic review services. The library also has access to a systematic review data management system called Covidence, which she would be happy to demo for you. Need help incorporating metrics into your dossier or complying with IUPUI or federal public access policies? Is a journal, tool, or book unavailable from the library that you would like us to purchase? Let her know. The library has a budget specifically for public health, and she takes requests.